Please Note: Over the years there have been variations in the internal dimensions of the T3PA (non-PRO) pedals. 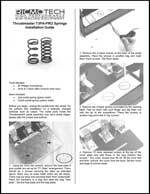 The springs may require some tweaking to get them to fit properly depending on when your pedals were manufactured. These modifications could involve spreading the final coil on one end of the spring to fit around the mounting point and/or may require cutting one coil of the spring. 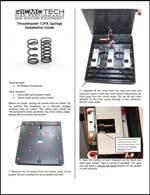 These are simple modifications and allows us to provide one set of springs that will fit all variations of the pedals.